Eduard Hellvig, currently a conservative MEP who has been chosen by President Klaus Iohannis to be the next chief of the Romanian foreign intelligence service, has published an article in which he warns of the “threat for the EU” from the rapprochement of Hungary with Moscow. In an article published in his blog and republished bytHotnews, Hellvig, who is a politician from Romania’s German minority, writes that Romania and the EU face an unprecedented case – “the blatant prejudice against liberal democratic values by the regime of Victor Orbán”, the Hungarian Prime Minister. “Hungary tends to be a threat to European architecture, a Trojan horse increasingly under the influence of Moscow,” Hellvig writes. Hellvig argues that the EU cannot afford ‘misbehaving of the British or Greek type” or “double play in the style of Sofia, Rome or Nicosia”. For the first time in the post-Soviet period, Russian has an offensive military doctrine which foresees the use of nuclear weapons not only in case of a nuclear conflict, but also in a conventional conflict, Hellvig writes. He adds that Eastern Europe is especially targeted, in the perspective of a NATO enlargement, of installing an anti-ballistic missile shield or of any preemptive actions which would be seen by Moscow as hostile. Therefore, Romania, Poland, Estonia, Latvia and Lithuania become “the main targets of the Russian imperialism”, writes Hellvig. The author argues in favour of strengthening the military capacity of his country and increasing military spending at 2%, a goal dear to President Iohannis. He also argues in favour of the consolidation of the country’s institutions, as well as the rule of law, of “reclaiming a society still undermined by corruption”. Progress in this field achieved in last years, especially in 2014, “have helped save Romania from a Ukraine-type scenario”, writes Hellvig. The author also argues in favour of Romania playing a major role in supporting reforms in Ukraine and Moldova, Romania’s neighbour in which most of the population speaks Romanian. Victor Orbán, whose conservative Fidesz party in April won a new four-year term, has been accused by some parts of the EU of seeking to amass too much power and rejecting democratic checks and balances. Orbán has made it clear that Hungary would act according to what was in its national interest, even if that meant annoying its allies in the European Union and the United States over the country’s relations with Russia. Last year, Orbán agreed with Putin on a loan of about €10 billion to build two additional reactors in the country’s only nuclear central in the central city of Paks. On 17 February, Orbán hosted a visit of Russian President Vladimir Putin to Budapest which raised eyebrows in many European quarters. These public statements are worrying, even more so as made by the next chief of a Foreign Intelligence Service. What is becoming the EU? A Super-State in which any member State is declared an EU enemy if it has different views from others regarding third countries? The EU would soon become more a battlefield between member States than a real Political Union. Such de facto official Romanian statements paradoxically are justifying Orban’s statement that the EU is already divided in two groups regarding the essential question of the relations with Russia. And they announce simply that one group is already comprising not only Estonia, Latvia, Lithuania and Poland (and therefore the very unrepresentative President of the European Council), but also Romania. I only hope that the Romanian citizens are aware of that and agree to that. Otherwise the “democratic values” are just in Romania at stake. Romania should be more concerned about existing Russians zones of influence in Moldova, some near it’s northern borders, and with Transnistria an open sore protected by Russian troops in the north. Britains problems with the EU are totally unrelated with Greece and Hungary’s, and it weakens his arguments to spread the “blame” by inferring we are in the same situation. especially, because I’m an European citizen and Orban (and their ally Jobbik) represents a real, insidious danger for Europe (and the EU) … and even more for Hungarians themselves. Eduard Hellvig is totally correct ! Remember the only 1 Blackmail from Russia to Kiev if Janukovitch remains in Power the Ukraine will get it gas cheaper ! After Januko has been ousted beginning with the Orange Revolution Russia rose the gas again ! Then Europe reversed the flowing gas to Ukraine . Today Erdogan dealed with Pute to get it’s gas cheaper in exchange to stop the reverse flow of gas to the citizens of Ukraine !! Russia doesn’t stop there but trys insidiously to find Partners what nearer then better ! Hungary could be a military fulcrum for Russia as well ! So that is no joke whatever Realtionship Hungary is going to have with the former CCCP KGB Agent . Szeretném, ha valaki lefordítaná Hellvig úrnak. Csak egy szürke kis magyar vagyok, de nagyon örülök, hogy a lengyelek után Önök is felszólalnak a nálunk zajló esztelen esemény ellen. A magyar nép nem akar újabb 56-ot, ezért nem nagyon merünk er?szakosan cselekedni. De higgye el, Uram, hogy a józan paraszti ésszel él? embereknek teljesen más elképzeléseik vannak a mai viszonyokról. A szomszédainkkal való viszonyunkat is mesterségesen gerjesztették a politikusok, hiszen a nép nagy része nem akarja vissza a nagyMagyarországot – mit is kezdenénk vele, mikor ezzel sem bírunk. A más országokban él? magyarok pedig els?sorban a hazájuknak tartoznak toleranciával, nem pedig egy “idegen” országnak, még akkor is, ha alapvet?en magyarok. Viszont azt megjegyezném, hogy például a nálunk él? svábok nyugodtan beszélhetnek németül, kiírhatják két nyelven a helységük nevét, stb. Az viszont, amit most Orbán Viktor m?vel, a sleppje kivételével egész Magyarországot irritálja, s?t a nép már kétségbe van esve. Ráadásul bizonyos félelmeink nekünk is vannak, hogy ?rült vezérünk elszakít Európától, az Uniótól, pedig az odatartozásunkat a nép szavazta meg! Milyen alapon szegülnek szembe a nép akaratával? Örülnék, ha minél több tekintélyes külföldi vezet? ostorozná Orbán – finoman szólva – helytelen magatartását! Minden ilyen felszólamlás talán egy kicsi segítség nekünk, akiknek nincs beleszólásunk a saját sorsunkba. Csak azért írtam, hogy tudjon egy egyszer? ember érzéseir?l is. Clearly with Johannis’ election Romania now follows Germany’s guidance in foreign policy/defense – witness Hellvig’s appointments as chief of intelligence. This is an improvement, as the previous president was undoubtedly a CIA “asset”. The concerns voiced by Hellvig are Germany’s concerns, which means that some way will be found to accommodate Russia and derail the US attempts to keep the flames of conflict burning in eastern Europe. This is wise – Russia will always be there, while the US is the most unreliable ally anybody can have the misfortune of dealing with. Remember Henry Kissinger: “to be the enemy of the US is dangerous, but to be its ally is often fatal…”. Yes, eastern Europeans seem to be tired of western Europe’s highhandedness and tend to dream of the US as the “white knight”, but choosing Europe (including Russia) over the US is the lesser of the two evils. Eduard Hellvig is a NATO enthusiast and that kind of says it all. EU needs its own defence and the sooner we get rid of Americans in Europe the better. It is simply naive to think that any comments coming from a Romanian politician says about Hungary could be objective in any way. Perhaps Hellvig is right – but coming from a Romanian US apologist and aggravating the ages old Romanian / Hungarian feud……nobody will and nobody should listen to him. 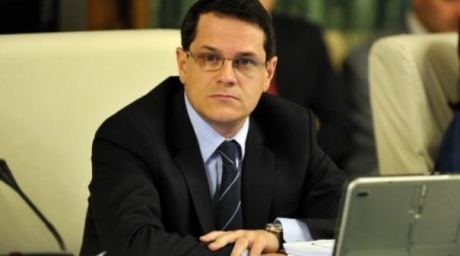 correction – is nominated to become head of romanian intelligence service.. not foreign intelligence service.. It appears that Hungary is not alone in the EU, whereby, some citizens are becoming increasingly disenchanted with European elites and supra-national institutions such as the European Commission, which impose rules and regulations that conflict with their countries’ economic interests and sovereignty.